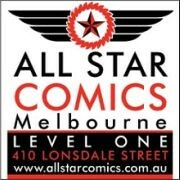 If you hang around the AFB Forum at all, you may have picked up that one of our running gags is bagging on the X-Men’s Gambit. I really can’t remember how it started, and I don’t know that any of us seriously have anything against Marvel’s Ragin’ Cajun, but we always get a good humoured rise out of our friend Engineernerd from TV & Film Toys whenever we do - which just encourages the joking! All of that is to say that I’m sure the comments at the Forum on my review of the Marvel Select Gambit Figure will be fun to read! Gambit started his X-Men career just after I gave up comics for an extended period, and was all over the place when I came back to it. I’ve read many stories which featured Gambit, but I can’t say I’ve ever read a great one. Despite that, he’s a visually striking character and a very significant character in the life of one of my favourite X-Men, Rogue, so I have always been a bit interested in him. I’m seriously regretting not buying the Sideshow Premium Format Gambit now that we know Rogue is coming! Marvel Select has been producing a good range of X-related characters of late, allowing collectors to do a bit of team building which is a bit unusual for the MS range. We’ve recently had Cyclops, Juggernaut and Magneto, and Colossus is on the way. Gambit is one of the most interesting inclusions yet and gives hope to see some other non A-list characters down the line. Marvel Select excels at over-sized characters like Abomination and Juggernaut, but sometimes leaves me cold with their regular-sized figures due to a couple of issues with their structure. In particular, the standard-issue ball-jointed hips have been a sticking point with me, as they can make a character’s trunk look too big, as happened with the Captain America (Bucky Barnes) figure. Thankfully, Gambit’s trenchcoat covers some of these sins, and this is assisted by what appears to be a more slender buck with chest articulation to create a look that isn’t overly bulky. The headsculpt on this figure is really outstanding. It’s very comic accurate and has some brilliant detail. 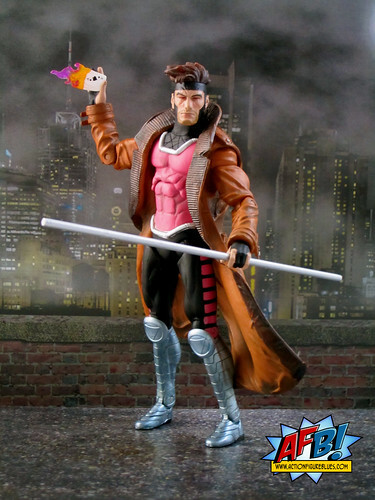 Gambit’s costume is also very nicely sculpted, with nice touches like the edges on his outfit and ridges on his boots being sculpted detail instead of just painted on. 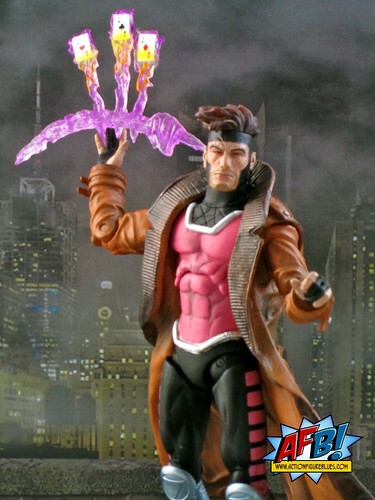 Gambit’s trenchcoat is beautifully sculpted and detailed. It has a lilt in it as though it is flowing in the breeze and some beautiful detail. Part of this detail is achieved by a paint wash to add depth, but there is also a fair bit of customised sculpting in both the wrinkles in the jacket and its trim. It’s an impressive effort. Despite it’s size, the trenchcoat doesn’t keep the figure from standing up and being posed. If you like accessories, they are present in this pack with great abundance. I sometimes struggle with the normal sized characters being value for money in this line, but Gambit comes with enough different gear that I don’t mind the price. Weapons-wise, he comes with his staff and several variations of his trademark “charged-up” deck cards - a small set that sits in his hand, and then two “blast” sets that can be used to set up a more dynamic look. The figure also comes with two sets of hands to give more flexibility in creating these different poses. 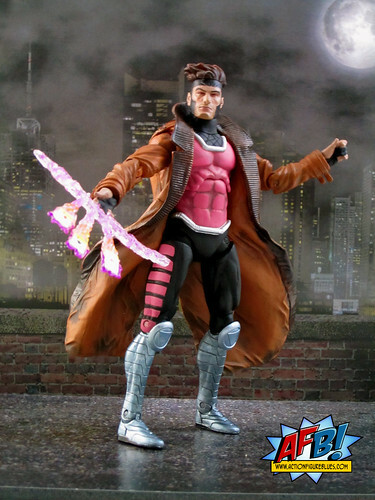 Gambit comes with a display base which can join together with Cyclops’ base to form a Danger Room backdrop which will grow as further characters are released. This is a great idea and more useful to me than some of the larger bases that are great in theory but impossible for me to use because of the space involved. It’s great to see the Marvel Select line continue to go from strength to strength, and I’m particularly pleased to see some team building happening in this line at long last. I’m looking forward to Colossus joining the team, and very hopeful to see the likes of Storm, Nightcrawler and others sooner rather than later! As good as it gets for a guy who wears pink. It's Raj that can't stand Gambit. Nice one Andy!